Anna Azizzy BFA ’17, Summer Leavitt BFA ’18, Paul Peng BSCA ’17 and Rigel Richardson BFA ’13 participated in “Erotica Night” at The Glitter Box Theater on Feb 2, organized by Anna Nelson BFA ’13. Marian Galczenski MFA ‘78 was commissioned by the city of San Luis Obispo, CA to create “Flower Power,” a painted utility box. Christina Lee BFA ’14 illustrated the cover of last week’s Pittsburgh City Paper and was interviewed by the publication. Mary Maggic BSA ’13 exhibits in “Refiguring the Future” presented by Eyebeam and organized by the collective REFRESH at the Hunter College Art Galleries in New York, opening Feb 8. 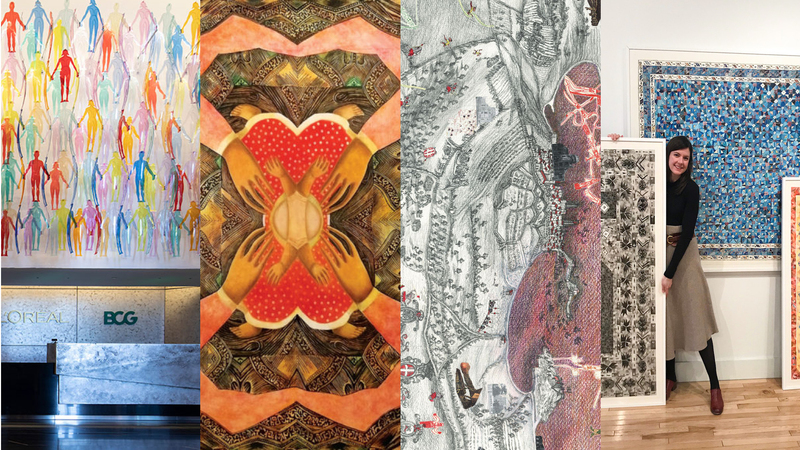 Carolyn Muskat BFA ’87 will receive the 2019 Excellence in Teaching Award from SGC International, an non-profit focused on prints, drawings, book arts, and handmade paper, at their conference, Mar 6-10 in Dallas. Paula Overbay MFA ’80 is part of a four-person exhibition titled “Indra’s Net” at The Mueller Gallery in Caldwell, NJ, opening Feb 6. Paul Vanouse MFA ’96 has a solo exhibition titled “Labor” at the Burchfield Penney Art Center at SUNY Buffalo State, through Mar 31. Audra Wist BFA ’12 has a solo exhibition at Home Alone LA, opening Feb 9.